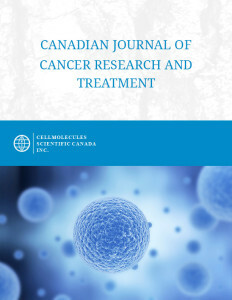 Canadian Journal of Cancer Research and Treatment publishes reports of novel results in wide area of cancer research and therapy, from basic to molecular and cellular cancer biology to translational and clinical oncology. The journal publish papers that are judged to be technically and scientifically sound. The novelty, and indeed particular importance of the paper is judged and determined after publication by the readership, and citations. The aim of the Journal is to promote the exchange of ideas and concepts across the entire cancer community, cultivating new areas of basic research and clinical investigation. The journal consider papers for publication in any aspect of cancer biology and clinical research, including but not limited to Genetics, epigenetics, genomic instability, Cell signaling and communication, Cell cycle, DNA repair, Diagnostics (molecular profiling, pharmacogenomics), Telomerase and transformation, Apoptosis, Angiogenesis, metastasis, Animal models, Cancer therapy (rational drug design, small molecule therapeutics), Epidemiology and prevention. Processing Charges that will be billed to the submitting author after the manuscript had undergone peer-review, if recommended for acceptance and upon acceptance of the article for publication in accordance with the following table.